Many urban cyclists that live close to their destination opt not to carry tools or any kind of repair kit. It’s a bit of a gamble, but carrying extra equipment riding in the city can be a hassle, especially if all you really need is your wallet or pocketbook. 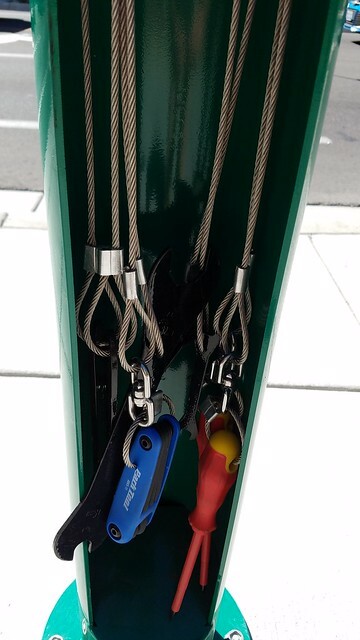 And leaving tools on your bike at the bike rack is an invitation for theft. The odds are that there won’t be any issues, but if there are, it can mean walking unexpectedly for a mile or more. If you fall into this category, as I do, you will be exited to learn that a downtown bicycle workstation has been installed in front of City Hall near the corner of Carson Street and Proctor. It was made possible by funds donated to Muscle Powered, and was installed by Carson City Public Works. The workstation includes a bicycle pump that works with both Presta and Schrader valves, and a bicycle repair stand with a variety of tools hanging underneath. Most of the tools you’ll need to do repairs and adjustments are here, including screw drivers, hex keys, tire levers, and wrenches. 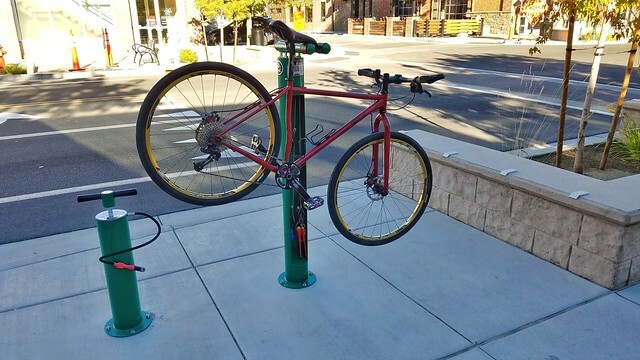 There is also a bike rack here if you need to leave your bike to get parts. The Bike Smith is located just 0.3 miles to the north. 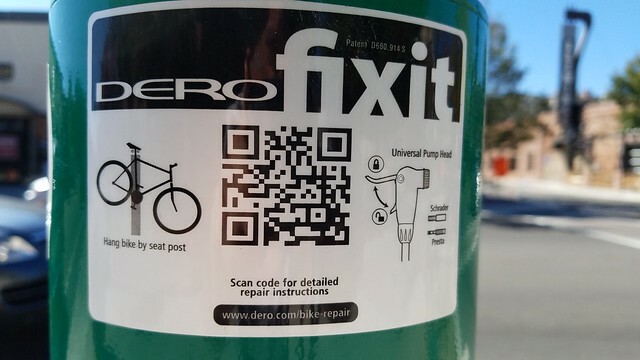 There are instructions on the repair stand for hanging your bike and using the pump, and there is a link to the manufacturer’s website that has instructional videos for most basic adjustments and repairs. I gave the workstation a try on my morning commute. I have a slow leak in my rear inner tube that I haven’t gotten around to fixing yet. Instead of inflating it at home, I took care of it downtown. The pump head popped off the valve once while inflating, but it got the job done. There’s also a pressure gauge on top of the pump to get your tires just right. I also tried out the repair stand, hanging my bike by the seat on the rubberized hanger arm (Note: looking at the diagram, I see that I didn’t follow instructions!). The stand allows the pedals and wheels to spin freely while making adjustments. This workstation is a great addition to the city’s cycling infrastructure. It will come in handy for the avid bicycle commuter, families visiting the downtown businesses by bike, and the frequent special events that draw out the cyclists. There are enough tools here to make more permanent adjustments, or to at least get your bike running long enough to get home or to the bike shop. I’m also told that we may see more of these workstations around town if it is shown this first workstation is used regularly.